We create websites that really stand out from the crowd and truly support your brand. We work hard at keeping things simple. The end-user experience always comes first - we produce elegant frameworks and smart layouts for your content to ensure a premium user experience. As well as usability our aim is to maximise visibility - your new website will be road-tested on all major browsers and great care is taken to ensure that all content is visible to the search engines - even animated elements. Imaginit offers solutions to satisfy the rapidly expanding mobile web market. 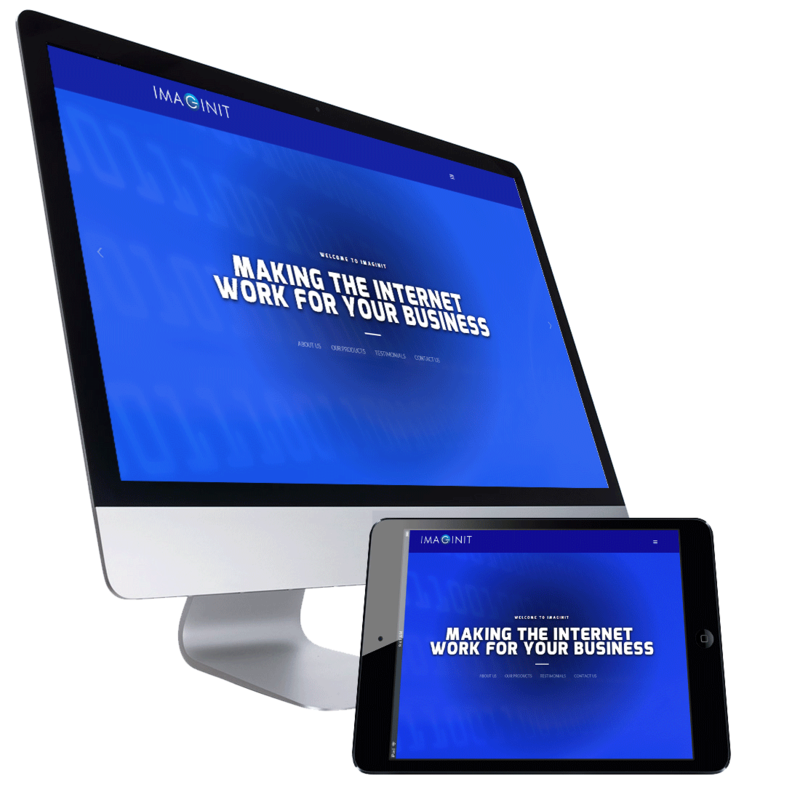 In the main, there are four screen sizes that your website will be displayed in: the widescreen desktop monitor, the smaller desktop or laptop, the tablet, and the mobile phone. Using HTML5, media queries and the latest CSS techniques, we will ensure visitors to your site get the best experience whatever device they're on. Whether you're selling a service and or physical products, Imaginit will provide the solution that suits you best - we've been doing this for over a decade. Setting yourself up as a merchant, learning to handle credit-card transactions while retaining PCI and data protection compliance, the world of e-commerce can be a very daunting and risky business to be in without the right partner to help you from start to finish. Imaginit will accompany you along the way. We can be totally flexible and can either build a solution to exactly meet your requirements or use a third party, ready-made solution. It all depends on what you prefer, what your budget is and what will be the best for you. For accepting and processing your customers' electronic payments you'll need to use the services of an internet payment service provider (IPSP). We will help you select such an organisation or, if you already have one, liaise with them to make sure your website works seamlessly with their systems. If you're offering paid-for content, or if you sell software with renewable licences, we can provide you with the perfect solution for recurring billing. We inform customers of their pending renewal and allow them to update credit card information as needed - this aids your customer retention, protects your cash-flow and minimises time-consuming renewal queries as customers will find it a snap to renew on time - every time. For recurring billing products and services, you will be able to accept PayPal and all major credit cards. Many other subscription solutions either do not support PayPal at all or require that vendors maintain a separate PayPal account. Unlike credit cards, PayPal accounts associated with subscriptions do not expire, leading to improved customer retention. Need to add a new page to your website? Need to remove or change some content immediately (a member of staff had been promoted or you've brought out a new product perhaps)? You don't know anything about HTML but don't want to pay a web developer and wait for the changes? ImaginEngineCMS comprises a suite of robust, tried and tested Content Management tools. Suitable for small to medium enterprises (SME's), schools, corporate bodies and government organisations, this application delivers immediate web publishing and a broad range of features from managing advertisements on your site to keeping your latest news, twitter timeline or online shop fresh and up to date. The application is server based and relies on standard browser technology to deliver a simple and easy to use WYSIWYG interface. No additional client software or per client licenses are required. ImaginEngineCMS allows website owners to publish content in real time with little technical know -how. Although it is designed to require the minimum of training time and maintenance, Imaginit personnel are just a phone call away if you have any difficulties using the features. The system has grown and evolved in terms of functionality and includes features such as news and events publishing, content syndication, integrated search engine, simplified document management facilities for secure document downloads and administrative tools for member based sites such as clubs, schools and associations. Our customers now have the choice of using imaginEngineCMS's in-line news manager, or integrating their blog posts on third-party software solutions, so that these appear in, say, their website Home page. ImaginEngineCMS can integrate seamlessly with CRM solutions so that event, membership and e-commerce management happens in one place, making administration easier and more economical. We design and develop an app for both Android and iOS platforms. As an example of our app development for a trade association client, the app uses formulae and other data supplied by our client and calculates for the end user whether or not they should hire or buy an item based on borrowing and other costs. Integrating with Google post-code mapping services and GPS positioning the app displays a map, showing the consumer the locations of the nearest association member companies within a radius of, say, 15 miles. We have also produced a web widget of this so that members can include this functionality on their respective corporate websites. Oh, and one more important point. People seem to share the same perception of costs for mobile app development. A mobile app from Imaginit doesn't have to start at £15,000! This is where Imaginit really makes the difference. We have been responding to clients' needs for over ten years by developing bespoke solutions which exactly satisfy the requirement - nothing more, nothing less, so our clients just pay for what they need. On more than one occasion the conversation had started with is "it possible for us to...?" Or "is there a way to...?" and we've delivered the answer. Health and Safety officers can record how a company performs either remotely or actually on-site. Using our web interface, they can store their findings in a central database as they go. They can then produce custom reports using the data collected, for instance, comparing a company's performance against an industry standard. We have increasing demand for these services. We have a large member-driven client base such as Trade Associations and clubs. CRM systems invariably store member data and our imaginEngineCMS can share this data to make management of events, training, awards, online purchasing and membership easier and more economical. Many clients offer their customers or members huge resources of information. We have developed a method with which our clients can upload multiple documents to the webserver, and select which web page or pages they want these to be available for download. The administrator can add a short description, and the file size is shown to give the user the option to abandon a large download. This method is also secure in that a would-be hacker cannot guess the path to the document store. It is therefore ideal for storing and presenting confidential documents, especially when they are also only available in a protected part of the website, such as a members' only area. As a valuable service to its members one of our many trade association clients offered its members the facility to check customers' credit-worthiness at the point of sale. Using the website we'd developed for the association as the access point, our web application passes the information entered by the member to the credit agency's systems, which returns a response to the member in real-time via our web application. In a similar way to our credit checking integration, we have integrated with an Identity-checking package to protect members from identity fraud, passing data to the third-party database in a format that the system can read, and retrieving real-time responses for the member's peace of mind. A secure system developed by Imaginit to link to a global company's product database. This fully searchable web-based system enables retail outlets across the globe to quickly look up any aspect of a product from a latest recommended retail price, a technical specification document, an image or any related marketing material for local sales initiatives. Delivered and managed centrally by the UK-based manufacturer using easy-to-use web input screens designed by Imaginit, all the data is completely up to date, includes version-control, is accessible within seconds of any update and permissions-based so that the client can control who sees what. Our client can also produce custom reports on a wide range of user-analytics. In an age where cursive or joined-up writing of signatures is being questioned as ample fraud protection, Imaginit has integrated with a finance company to enable loan contracts to be assessed, created, submitted and signed, all remotely across the internet. Our ColdFusion Rapid Application Development language enabled us as developers to quickly build a routine for requesting, receiving and applying digital signature validation to PDF documents for this requirement. Our client can now enter into legally-binding contracts with the end user entirely on-line. There are many blogging software solutions available and starting a blog can be intimidating. You may also be thinking of using the services of a free blogging website, as it would appear that most of the heard work's been done for you. We will ask you exactly how you want to use your blogging solution, what special features you may have in mind, and then take you through the set up process in a step-by-step manner. This will invariably start with asking you to select a domain name for your blog, and then we'll select a solution that will work for you and arrange the hosting for you too. We will recommend a solution that we too can integrate with in order to configure the software to meet your exact needs. You'll be up and blogging by lunchtime!